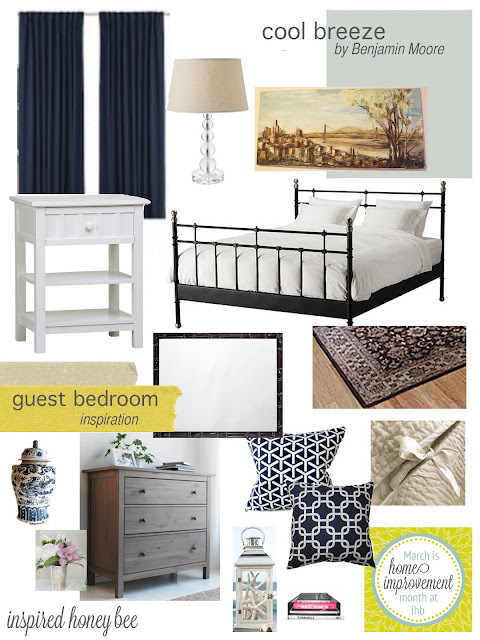 The most neglected room in our house is the guest bedroom. It's not a common room, only used when our family and friends need a place to stay, and can sometimes double as an extra bedroom for the kitty. And besides the space where we store all of our coats and gift wrapping materials, I have not given the design of the room much thought. Until recently. Although I won't call myself a designer, I will say that I'm a frugal planner. To keep this home improvement project on track and without spending large amounts of cash, I'm going to utilize most of our stuff and make sure that a fresh design is applied by following an inspiration board. The bed, rug and dresser are staying, and most of the bedding - no argument here. Three of the four walls are going to remain as a neutral white while the wall behind the bed will get a fresh coat of Benjamin Moore's Cool Breeze paint (also a Young House Love color choice). The art is a piece that was handed down to us by sweet aunt G and needed a new place to live. At this time, it needs a frame and some TLC, but it will look fantastic in the finished room. All of the other pieces will come into place as I work on this room before April 1! In the meantime, here's a sweet guide from the Jew in J Crew on how to get a spare bedroom cozy ready for that special guest! I can't wait to come visit and stay in this lovely room (its already lovely - pre updates!). 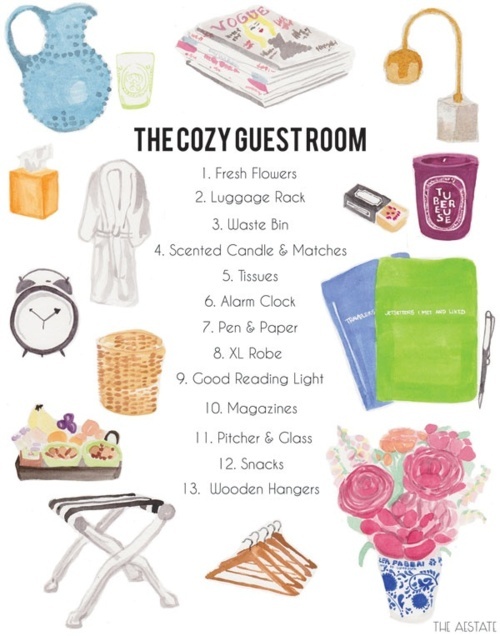 I love the list of guest room must haves! I have been very slowly putting ours together and need to add some items. Next on the search: luggage rack!